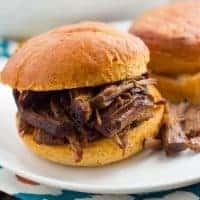 This is one of my all-time favorite beef slow-cooker recipes! It tastes delicious as a pot roast with mashed potatoes or your other favorite pot roast sides. It also tastes amazing as a sandwich. I like to save the liquid from cooking the beef for dipping the sandwiches. My favorite gluten-free buns are from Trader Joe’s. Be sure to use gluten-free balsamic vinegar, Worcestershire sauce, soy sauce and beef broth (not all of these ingredients are GF!) in this recipe. Sometimes I cut my chuck roasts in half when I buy them and they usually end up being around 1.5lbs. If you use a smaller roast, half the sauce. Transfer the roast to the slow-cooker. There should be some brown pieces in the bottom of the skillet now. Over medium heat, pour in 1/2 cup of beef broth to deglaze the pan, scraping up the brown bits. Pour the liquid into the slow-cooker. Add the remaining ingredients to the slow-cooker. Cook on high for 4-6 hours or low for 6-8 hours. Shred the beef into chunks with a fork, removing any pieces of fat. Serve as a pot roast with your favorite sides or on toasted buns with the liquid for dipping. Enjoy!